Perfect party wear, turns a girl of any age into Ariel with this gorgeous sequin number! Fin on skirt is on front only to make it easier to walk. Stretch fabric for comfort. Seaweed Boa sold separately. 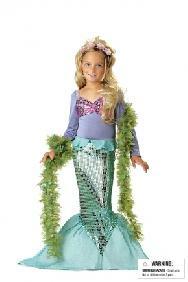 For smaller sizes to fit 3-6years see 'Toddler Lil Mermaid Costume'.